Perfect the tone of your complexion? Of course, with a sublime effect! However, this is only one of the many and effective actions that this excellent CC Cream provides: with a single application it covers discolouration, conceals blemishes, enhances your natural radiance. 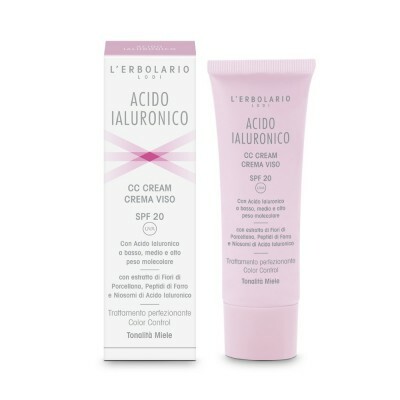 It features a light texture that blends in easily: your skin will gladly reveal all of its compact and smooth texture, ensured by the incomparable moisturising power of Hyaluronic Acid, contained in this formula in low, medium and high molecular weight. Plus, the innovative niosome solution carries the precious moisturising properties of Hyaluronic Acid deeper into the skin, preserving skin elasticity and density more effectively. To preserve its freshness over time, your face also needs to be protected from UV rays and stressing environmental factors: this is why it can count on extract of Spelt seeds, which offers all of its antioxidant power, enhanced by the action Porcelain Flower extract, which also provides an illuminating effect. With the help of this special plant-derived ingredient, and thanks to such an even, supple and silky appearance, your skin can truly be called … porcelain! After cleansing your face, apply it using a make-up sponge: you will achieve a matte-finish complexion, even yet very natural. Low, medium and high molecular weight Hyaluronic Acid, Hyaluronic Acid in niosome form, Extract of Porcelain Flower, Spelt peptides, Unsaponifiable Fraction of Olive Oil, Vitamin E from Soybean, Polysaccharides from Larch.